Cate: Please welcome Rebecca J. Vickery of Victory Tales Press to my special Halloween celebration. Rebecca, please tell us a little bit about yourself. Rebecca: Hi Cate and thanks so much for having us. I am a wife, mother, grandmother and an author and somehow I have stumbled into also becoming a publisher. Laura Shinn, my favorite cover artist, and I began talking about how writing short stories gave me back my excitement and enthusiasm for writing. We decided if it could inspire and help me, then other authors needed a chance to try it and we created Victory Tales Press just for romance anthologies. We now have about twenty authors who are doing stories in our various anthologies which will be available at holidays and various times throughout the year. We have two new anthologies for Halloween; A Halloween Collection Anthology: Sweet and A Halloween Collection Anthology: Stimulating. The Stimulating version is for those readers who like a bit more intimate detail or adult themes in their stories. Cate: What do you love most about Halloween? Rebecca: I really love seeing all the kids in their costumes and I like Halloween stories (but not the gory ones-LOL). I also enjoy the feeling of the spirits and the paranormal being just a bit closer to us for that one night of the year. I definitely love to watch old spooky movies and eat candy corn and chocolate snuggled up next to Hubby after everyone else is in bed. Cate: Do you have a favorite memory of a Halloween past? Rebecca: I think that would be from my teen years. A bunch of us went on a hayride through and around the local pumpkin patch. It was cold for Halloween and a special someone (at the time) and I cuddled and smooched. Then we all stopped at a friend's house and I had hot spiced cider for the first time. It's a simple, sweet Halloween memory that sticks with me for some reason. Cate: Have you ever had an unusual experience you couldn’t explain? Rebecca: My husband took me to Biltmore House and Gardens several years ago to see the castle all decorated for Christmas. The line was terribly long and wound back and forth through the trees alongside the driveway. While waiting, I heard several carriages and horses and people laughing in the driveway. I even asked my husband to step back so I could see them. There was nothing there. Then when we went in, I heard music and laughing in several rooms as if a party was going on, but my husband and no one around us heard it. I was very freaked out. Cate: So cool! What frightens you the most? Rebecca: Rats and druggies with large knives. LOL I was bitten on the toe by a rat as a child and have been terrified of them ever since. And just the thought of some drugged out person losing it and coming at me with a knife gives me the creeps. Cate: Definitely good reason for fear. Ever gone on a ghost tour? Or ghost hunting on your own? Rebecca: Only virtually and of course with Ghost Hunters on TV. But I would love to. We did go on one of the late evening carriage rides in Charleston SC once and there was a lot of talk of the ghosts who haunt the old section of Rainbow Row. We were riding along and there was a flashing light off to one side. Then the outer rim of one of the carriage wheels came off with an awful noise. The tour guide said we had just witnessed the work of a poltergeist. Definitely gave us all goose-bumps for the rest of the tour. Cate: Any favorite Halloween recipes you’d care to share? Rebecca: I love to make Mummy CupCakes and they are simple. Make the devil's food cupcakes according to the directions on the box. Once the cupcakes cool, snip a small corner off a baggie or use a pastry decorating bag and spoon in some of the frosting. Squeeze the frosting bag back and forth across the tops of the cupcakes, crisscrossing some to look like Mummy bandages. Then place two of the red candies for eyes and you have Mummy cupcakes. The grands love them and my Hubby and I eat anything chocolate that doesn't run away. Cate: Yum, thanks for sharing! Tell us about your release, and where readers can find it online. Rebecca: Both our releases are Halloween Anthologies. The first is A Halloween Collection Anthology: Sweet and contains five complete stories filled with ghosts and ghoulies, killers, an incubus and a giant tarantula, and missing women plus some sweet romancing. Markee Anderson, Charlotte Raby, Rita Hestand, Christine E. Schulze, and Kate Kindle sent us some excellent stories. Then A Halloween Collection Anthology: Stimulating contains angels and demons, legends, fortune tellers and Native Americans, sensual aliens, and ghosts and witches plus more intimate romances. The authors in this one are Karen Michelle Nutt, Cheryl Pierson, Laura Shinn, and myself. There are only four stories in Stimulating, but they are a bit longer. The easiest way to find us is at our home website where we have all the buy links in one place. Cate: Such a great lineup of authors! Care to share a blurb or excerpt? Rebecca: I would love to share our mini-blurbs for both books. Lydia Sanders is spending a lonely Halloween until Ian shows up to make sure she’s not depressed. They go for a drive then the car dies in the middle of nowhere in the rain. They have no cell phone reception. Their only hope is an old house within walking distance and the two eerie people inside. At midnight? On Halloween? Adrianne is satisfied running her cafe for the homeless and believes her life is complete, until she falls in love with a debonair stranger who wants his meals after hours and in the dark. She must find out what he's hiding and if their love is true or cursed. When the local town drunk sees a murder committed on Boot Hill on Halloween night, will anyone pay any attention to his story? Sheriff Joe Grubbs, though skeptical, investigates and finds the new grave. Now, he has a job to do and risks losing the love of his life. It's a harrowing Halloween night in Haleyville, Texas. Imprisoned in a basement, at the mercies of an oddly powerful incubus, Elissa tries to escape many times. But the giant tarantula guards his master’s toy well. Then a glimmer of hope appears. A boy moves in next door who knows things—secrets from the very heavens. Can he help her escape? Or will the incubus destroy him? Tony Gullo, a burnt-out-on-life New Yorker, takes an unexpected trip to the country with a friend. On the side of the road he sees a haunting sight. A beautiful woman stands poised on the roadside, seemingly in a trance. When the men stop to offer assistance, she flees into the woods. How will he ever find this beautiful creature, if she really exists? Clarity Shaw, a reporter for Unbelievable Finds, seeks answers concerning the curse of Tempest Gate Cemetery, but she finds out more than she bargains for when she sits in the devil’s chair. Two entities need her for their own personal reasons, but only one will demand her heart. At a children’s Halloween carnival, a Gypsy fortuneteller predicts a new love for both Cindy and Gage. When the two meet over a poorly carved pumpkin, love flickers to life and the stars begin to align. After all, Gage has been burned before and Cindy doesn’t believe in fortunes or second chances. Can the star-crossed pair put their faith in the love that was foretold? Orekon, a desperate Astovian prince, has three days to find a mate, become mated to her, and return to his world. Kathryn Schaffer is from Earth, a mild woman who plays in the Fort Worth Symphony Orchestra. The attraction for Orekon is immediate, but Kathryn is kept in the dark, literally. She must trust her instincts and feelings to make the most important decision of her life. Will she trust a complete stranger, even though her heart sings when she’s in his arms? Trudy decides she must have lost her mind by agreeing to house-sit a huge old Victorian during Halloween week. Lights switching on and odd noises lead to her meeting a certain, handsome police officer. The scare is almost worth a chance at love—until the ghost takes over on All Hallow’s Eve. We have a free sampler of the first chapter from each story at ScribD for anyone who would like to preview these books. Cate: I'll definitely be checking those out. What inspired you to put together the anthologies? Rebecca: We had heard of a lot of publishers getting together Christmas or Valentine anthologies and often some will do the odd anthology especially for charity. But we thought it would be fun to do anthologies as a way to showcase short stories for lots of holidays and special projects. The response from the authors involved has been amazing and they come up with some of the most interesting and varied tales. I really think the authors have challenged themselves to improve their writing and to use these anthologies to try something new. Halloween seemed like a great time to share some of these unique stories and I was not disappointed. No two stories are the same, but each deals with Halloween and love in its own way. Don't be surprised to later see full-length novels come from some of the ideas these authors had for our anthologies. Cate: Great idea. Anything else you’d like to share? Rebecca: We want to be sure everyone looks for the Victory Tales Press anthologies for Christmas. We will be sharing four books that will be great reads and make wonderful gifts for the readers on everyone's Christmas list. They will be available for the new ereaders and computers and in print. Check at http://victorytalespress.yolasite.com/ in November and December to find them. We want to say a big thank you for having us here and to all the readers and supporters who make VTP possible. Giveaway: We would like to give two separate commenters, randomly selected, their choice of an ebook of either of the Halloween Anthologies. The giveaway will end Nov 1st and the drawing will be held on Nov 2nd. Winners to be notified by email. Cate: Wonderful! Thanks so much for being my guest Rebecca! Best of luck with all your projects. Thanks for having us Victory Tales Press authors on hand today, Cate. Yor site is very attractive and exciting and almost 3D! I agree that having the assignment of writing a novella length story focused me on creativity and made me feel renewed. I am a fan of short stories and novellas. Right now, I am reading John Steinbeck's works. I get a beautifully written short story and I get it in one or two brief sittings. His are memorable and, I believe, ours are, too. People who have them will pull them off their shelves next year at this time and share them. It used to be that Redbook, LHJ had a few short works of fiction by famous names monthly. I understand from some of our romance authors that short stories fly right off the shelves of online bookstores. I'm glad they are being enjoyed as I have always loved them! Hello and Happy Halloween to the VTP authors! 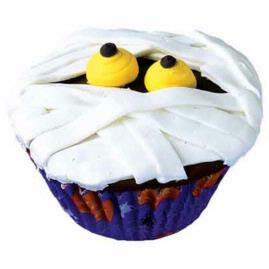 Those mummy cupcakes are adorable! I think shorts are making a comeback and it's a great way to introduce authors to a wider audience. Best of luck! Thanks once again to Kate for having us on her blog today. Thanks so much for your wonderful contribution of I Love Pie! to the Sweet Halloween Anthology. Thanks so much for stopping by. Your name is in the hat for the drawing. Enjoyed the interveiw and hope the readers enjoy this books. There is something for everyone in the anthologies, no matter what you prefer. Hi Everyone! Glad to be here! I love writing short stories, because, like Rebecca said, you have to write tight if you want to get a lot crammed in to a little space! Thank you for having us, today, Cate!!! Your blog is beautiful!!! This was a fun story to write...way outside my comfort zone, but a blast! Larry - was it good advice at least? Hi Rebecca! Glad to have you and your authors here. These collections look wonderful. Cate, as always, your questions are so unique and good, and again, I have to tell you how much I just love your site. Rebecca, I enjoyed your answers--and those cupcakes look wonderful. I've had some unexplained things happen to me, too, and I always feel like the Cowardly Lion on The Wizard of Oz, going, "I DO BELIEVE IN GHOSTS! I DO I DO I DO BELIEVE IN GHOSTS!" LOL When something like that happens to you, there is no doubt in your mind that there is "something more" out there that we might not be able to explain, but it is THERE. Great interview! Thanks so much for putting out the blurbs for all the short stories in the anthologies! I've been hearing about these anthologies everywhere. What a fabulous idea! Cheryl, you crack me up! I can just picture the Cowardly Lion tugging his tail between clasped paws. And thanks for the kind words. I really enjoyed your stories in the Anthologies too. Both different, but excellent tales of romance. Don't those kind of visitations give you goose bumps and an eerie feeling for the rest of the night? Hi, all. This is Christine, author of "The Memory Charmer and the Boy Next Door" from the sweet anthology. Hope you enjoy my story and all the rest! Please consider checking out my anthology from Victory Tales Press, as well as my other fantasy and Christian fantasy works for young adults on Amazon and Goodreads. So glad you came by and we're happy that you enjoyed writing the story for our anthology. It is definitely a good one. 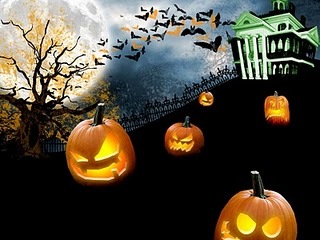 Happy Halloween one and all!! Thanks so much for having us here, Cate. Hi Rebecca! Rebecca is a wonderful and talented lady! Though I do enjoy the full length novel, I have to say the short stories are gems. They're quick reads to enjoy when time is pressing.